On sale (regularly $2.99) 2/1/2016 - 2/8/2016! Christine Grote's memoir of losing her father to Alzheimer's, and her father Jerry's account of the defining moments of his life from birth in the 1930's are two stories interwoven in one book. Grote invites us into her parents' home where accommodations are continually made for her father's declining condition, and she allows us into her heart as she struggles to accept his loss. The two stories move in opposition as Grote's story of struggle and loss travels backwards in time. 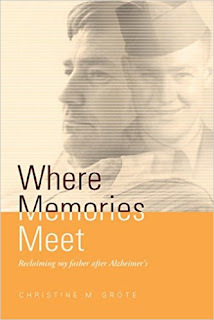 The unconventional story timeline allows Grote to move past memories of the heartbreak of Jerry's last years, and in effect, reclaim her father after Alzheimer's.